What Happens When the Machines Take Over? HomeFeaturedWhat Happens When the Machines Take Over? What happens when the machines take over? When robots, using artificial intelligence, can do almost everything better than humans – and the only jobs left are those building and servicing the machines? What may at first glance look like a dystopic vision from a science fiction novel is, step by step, becoming a reality as the price of computing power falls and robots become ever more sophisticated. Even advanced tasks like speech recognition and automatic translation are now within the grasp of relatively cheap computer systems and smartphones. Will humans happily retreat into an increasingly virtual world, playing video games and chatting with other underemployed people, as recent research by Hurst (2016) seems to suggest is already happening amongst prime-aged males in the US? Or will displaced workers decide that enough is enough, and rise up against the increasing automation of tasks? Technology-induced unemployment was already on the minds of classical economists. David Ricardo, writing in 1821, added a whole chapter to his book on political economy, arguing that “the substitution of machinery for human labour, is often very injurious to the interests of the class of labourers.” The idea that rapid technological change would immiserise the working class and ultimately lead to social unrest was also at the core of Karl Marx’s predictions. More recently, Wassily Leontief argued that the “spectre of technological unemployment that provoked Lancashire weavers into a revolt 170 years ago, but that receded after the demand for skilled workers needed to operate complex (but dumb) machines replaced the demand for unskilled physical labour, is here again. 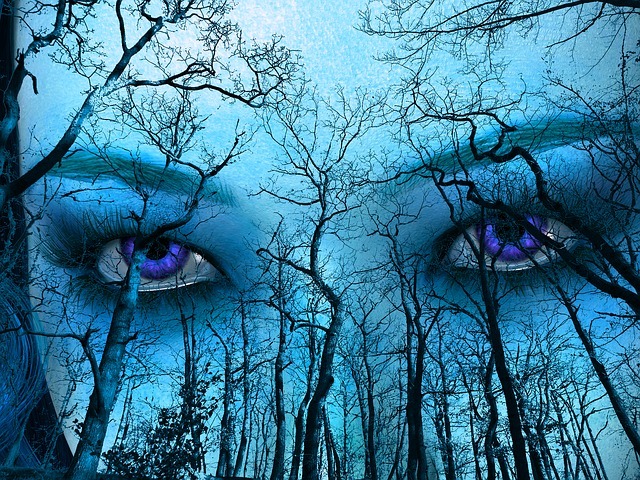 But there are good reasons to believe that this time it will not retreat” (Leontief 1983). And yet, until recently, textbook treatments of technological unemployment generally downplayed the possibility of important social and economic disruption (Summers 2013). While there is growing evidence that the replacement of humans with machines for routine tasks can lead to dislocation in the labour market (Autor et al. 2003), empirical support for the idea that technology-induced unemployment creates social unrest is conspicuously absent. Even classic historical examples of technology-induced unrest, such as the famous Luddite attacks on industrial machines and the Captain Swing riots in industrialising England, have been called into question: in the “…Luddite (1811-16) and Captain Swing (1830-32) riots, the role actually played by the concerns of labourers about being replaced by machinery has been greatly exaggerated.” (Mokyr et al. 2015). But, if the new machines were not the cause of protest in the case of the Swing riots, why did workers put them at the centre of their protests? Why did the Swing rioters ask their masters to destroy the new threshing machines themselves – and why did they proceed to break these machines and set them on fire when masters refused? While the literature has proposed alternative explanations for the outbreak of the Swing riots, emphasising an influx of Irish labourers, the spillovers from the 1830 revolution in Paris, and discontent about the administration of the Poor Law, we believe that the role of new technologies should be returned to centre stage. In a recent paper, we collect new evidence on the spread of a labour-saving technology in industrialising England (Caprettini and Voth 2017). We show that it is associated with unrest on a substantial scale, and demonstrate that there is indeed a causal connection between the introduction of the new machines and social unrest during to the Swing riots. Between the summer of 1830 and the summer of 1832, riots swept through the English countryside. Over no more than two years, 2,000 riots broke out – by far the largest case of popular unrest in England since 1700. During the riots, rural labourers burned down farmhouses, expelled overseers of the poor, and sent threatening letters to landlords and farmers signed by the imaginary Captain Swing. Most of all, workers attacked and destroyed threshing machines. Threshing machines were used to thresh grain, especially wheat. Until the end of the 1700s, threshing grain was done manually and it was the principal form of employment in the countryside during the winter months. Starting from the Napoleonic Wars (1803-1815), threshing machines spread across England, replacing workers. Steam threshers could finish in a matter of weeks a task that would have normally kept workers busy for months. Their use arguably depressed the wages of rural workers. Eventually, in the summer of 1830, rural workers revolted, and staged the Swing riots. Figure 1 gives an overview of the riots, using data from Holland (2005). While almost the entire country saw some kind of unrest, riots were concentrated in the southwest of England. Nonetheless, even within regions we observe wide variation in the incidence of riots, with areas with and without incidents located immediately adjacent to each other. Earlier work has already analysed the spread of unrest throughout the English countryside, and its effect on constitutional reform. Aidt and Franck (2015) concluded that the riots were crucial for the big expansion of the franchise in 1832. Aidt et al. (2016) show that the riots spread along communication networks. We are interested in the role of new technology in creating unrest. In particular, we are interested in the diffusion of the new threshing machines. To pin down effects, we need a good measure of when technology spread where, and an explanation that accounts for differences in adoption. 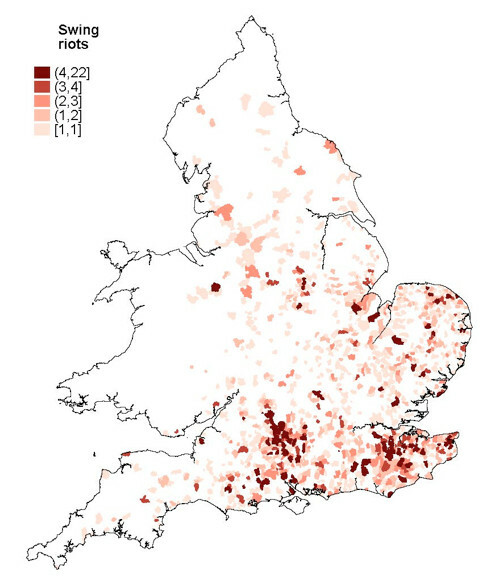 To see if the adoption of labour-saving technology played an important role in fanning the flames of discontent, we collect new data on the adoption of threshing machines by examining farm advertisements in local English newspapers. Whenever a farm was for sale or its lease came up, adverts would be placed in local newspapers. These adverts would list in great detail all the relevant characteristics of the property, from the size of the plot to the farmhouse and any machinery that went with it – including threshing machines. We analyse data from 66 newspapers over the period 1800-1830, with a total of 118,758 articles of all kinds. Among these, we found 409 advertisements in 363 parishes that mentioned the presence of a threshing machine. Especially in the years after the end of the Napoleonic Wars, the number of adverts mentioning threshing machines surged. Figure 2 plots the location and intensity of threshing machine uptake, as documented in newspaper advertisements. 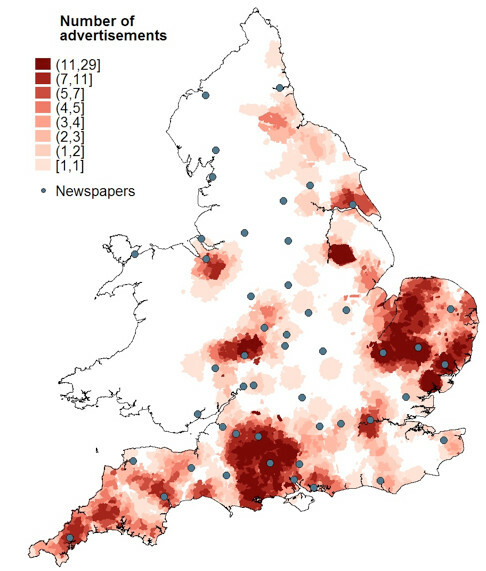 Note: Blue dots show the location of cities that printed at least one of the newspapers we use. A very simple statistic shows the change in the frequency of riots. 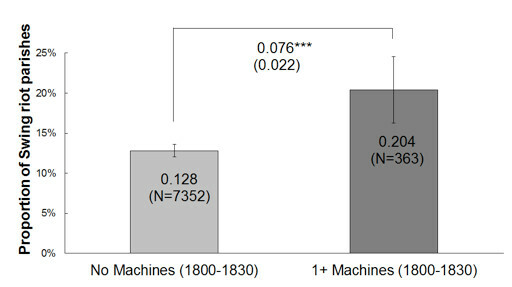 In places where no advertisements for farms with threshing machines were published, the probability of a riot was 13%; in places with threshing machines it was 20%, or about 1.5 times higher (Figure 3). When we focus on attacks on threshing machines or other agricultural capital equipment, the averages are lower but the relative difference is greater: 3.6% to 7.4%. This suggests a large effect of new technology adoption on social instability. The places that saw the highest probability of unrest were also the ones with the highest adoption rates of threshing machines. The relationship we uncover may nonetheless not be causal. It could for example be that areas with more newspapers carried more adverts for threshing machines, and also had better coverage of riots, for example. We rule out this possibility by showing that, while riot probabilities seem to decline with distance from the place of publication of a newspaper, the same is not true for advertisements – proximity to a newspaper location is not a good predictor of coverage by farm advertisements. We also show that, if we only look at places no further than 40km from the nearest town with a newspaper, we find exactly the same effects. A crucial question is why some places adopted the new technology before others. If take-up was driven by factors that could also directly influence unrest, we would not identify a clean effect of labour-saving machines on unrest. Also, the estimates may be biased downwards if landlords feared unrest, and consequently introduced fewer machines. To pin down causality and gauge magnitudes correctly, we look at the nature of a parish’s soil. In particular, we examine soil suitability for wheat, as established by the Food Administration Organization (FAO). The FAO classifies all the world’s land by suitability for various crops. We use modern-day data on England’s soil to see how suitable different parishes were for the cultivation of wheat. The reason why we care about wheat is that it was the only grain suitable for machine threshing – other grains, like rye and barley, could not be threshed economically by early threshing machines. When we compare the maps of technology adoption with FAO wheat suitability data, we notice a great degree of overlap. Where the land is good for wheat, according to the FAO, farmers bought a lot more threshing machines (left panel, Figure 4). 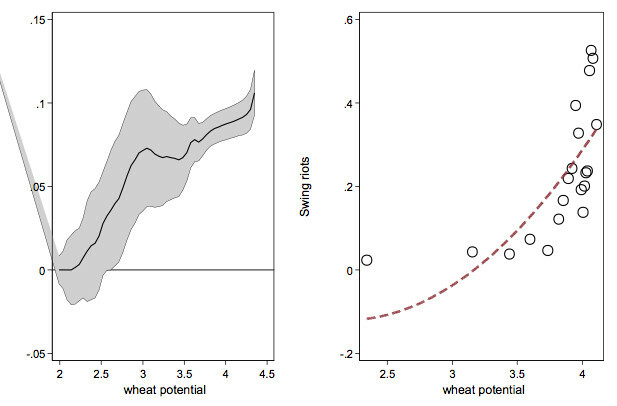 Importantly, the part of the variation driven by soil characteristics also predicts unrest (right panel, Figure 4). 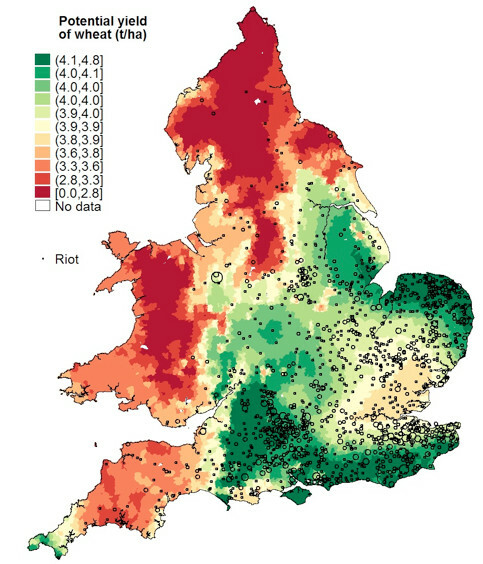 When we superimpose the wheat suitability on a map of unrest in England (Figure 5), we see that even within areas that were mostly grain growing, unrest was higher where wheat was a more productive crop. This suggests that it is not some other set of economic factors that simultaneously drove technology adoption and unrest – it was the use of new machines to save labour in threshing wheat that directly led to more riots, more farms torched, farmers threatened, and capital equipment broken. Note: The darker the green, the greater soil suitability for wheat; the darker the red, the lower the suitability. Over the last 200 years, new machines have increasingly replaced humans, and output per capita has surged more than ten-fold in most industrialised countries. At the same time, working hours have decreased from around 3,500 hours per year to around 2,000 for full-time employees, and an ever-smaller part of human life is spent working (Voth 2001). While the enormous increase in output per head as a result of technological change has contributed to rising living standards, it has also led to sharp declines in labour demand among the lower skilled. We examined the extent to which the replacement of workers by technology can lead to rage against machines. Our results suggest that, in one of the most dramatic cases of labour unrest in recent history, labour-saving technology played a key role. While the past may not be an accurate guide to future upheavals, evidence from the days of ‘Captain Swing’ serve as a reminder of how disruptive new, labour-saving technologies can be in economic, social, and political terms. •Aidt, T S and R Franck (2015), “Democratization Under the Threat of Revolution: Evidence From the Great Reform Act of 1832”, Econometrica 83(2): 505–47. •Aidt, T S, G Leon, and M Satchell (2016), “The Social Dynamics of Riots: Evidence from the Captain Swing Riots 1830-1831”, working paper. •Autor, D H, F Levy and R J Murnane (2003), “The Skill Content of Recent Technological Change: An Empirical Exploration”, The Quarterly Journal of Economics 118(4): 1279–1333. •Caprettini, B, and H-J Voth (2017), “Rage against the Machines: Labour-Saving Technology and Unrest in England, 1830-32”, CEPR Discussion Paper 11800. •Holland, M (ed.) (2005), Swing Unmasked: The Agricultural Riots of 1830 to 1832 and Their Wider Implications, FACHRS Publishing. •Hurst, E (2016), “Video Killed the Radio Star,” speech at the 527th Booth Convocation, Chicago Booth School of Business, Chicago. •Leontief, W (1983), “Technological Advance, Economic Growth, and the Distribution of Income”, Population and Development Review 9(3): 403-10. Different?”, Journal of Economic Perspectives 29(3): 31–50. •Ricardo, D  (1996), Principles of Political Economy and Taxation, Great Minds Series, Prometheus Books. •Summers, L H (2013), “Economic Possibilities for Our Children,” NBER Reporter. •Voth, H-J (2001), Time and Work in England 1750-1830, Oxford University Press.